Recruiting is about so much more than just playing time. It's about convincing an 18-year-old kid that your campus and its surroundings are fun place to spend the next four years. That can mean promising an In-N-Out when there's no actual In-N-Out on the way. At left is a poster that was spotted at a recruiting event at Baylor over the weekend. Cooked up by the athletic department, it promises a bunch of really exciting new store openings in Waco, plus an Omni hotel (the kids love the Omni, apparently). When the picture got around, Baylor students and Wacoites got really excited—they've been clamoring for some of these for years! But the Waco Tribune has fact-checked the poster, and it's more wishful thinking than anything else. Pappas Restaurants group Spokeswoman Christina Pappas on Monday debunked the claims that the company would be building an eatery in Waco. "We are not building any locations in Waco," Pappas said in an email to the Tribune-Herald. In-N-Out and Whole Foods, too, have no plans to open up stores in Waco—though they have reportedly studied the possibility. 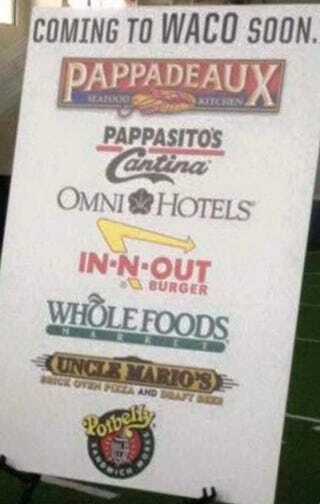 In Waco's defense, it will be getting a Potbelly and an Uncle Mario's later this year. Baylor Associate Athletics Director Nick Joos cleared up the origin of the mysterious board, which was created by the athletics marketing department and contained some truths and some falsehoods. "I think somebody just decided to throw speculation on a board and call it a poster," Joos said.